The most popular keyword tool “Google Adwords Keyword Tool” is now replaced by Google Keyword Planner, there are also other keyword research tools that can be used for Google keywords. Keywords are the very foundation of SEO, without analysing keywords, you can’t effectively promote your website. keywords are the search terms used by people to Google search item (words). A keyword can be single word or multiple words typed in the search engines. If you want to target a specific keyword, you must to use Keyword research tools, because they will help you to get the keyword ideas, the related keywords and statistics. For example you may want to find the weight of a keyword, in-fact you should, because you may have a keyword idea, but it may not be the best one, you should properly analysis by spending time in hours. Trust me, it’s worth to research and you’ll probably love them once you finish reading this post. Using wrong keyword won’t help you get targeted traffic, and if you are providing services or selling products, then in order to increase sales, you need to optimize your website for a specific keyword. Keyword tools also help you get combination of keywords, so that you can use them in your website contents. Peter kent who made tutorials for laynda.com argues, Do not skip keyword analysis step, Don’t assume you know the keywords, if you don’t do analyze then two things will happen. you’ll miss really important terms that people search for, you use terms that you think are important but they are really not. If you’re completely new to keyword research and don’t much about then read this guide to know How to do keyword research and once you learn the basics then use free online keyword research tools to save your time and do effective keyword research. There are number of keyword tools often refer by keyword research tools, that can be used for keyword analysis and finding the combination of keywords that are mostly searched in Google. the most important thing is finding the volume of a keyword, that is how much monthly searches of a specific keyword, global and local, for example you may want to know for a specific search term, the search volume in the United States. To do this keyword research there are pre-defined high quality web apps developed that make our work easy and we gather all information related to a specific term. 97% people use Google and Bing for searching, the part of Google is much more. other search engines such as Ask and AOL uses Google algorithm to some existent. So we need to use keyword tools for Google keywords, because if we Rank in Google, then we’ll probably also in other search engines. Today in this post i am going to share a list of Google keyword tools to make our keyword analysis work easier and to target a specific keyword as well as get more related words and find search volume. Highly Recommended!! I Personally used this tool and would highly suggest you give it a try, Click Here to download. It is Simple, Fast and Intelligent. It will save lots of your time. The best thing about this tool is that it will tell you exactly how much it is difficult for you to rank for a keyword. Moreover you can save keywords that you like as favourites. Google keyword Planner is the most popular keyword analysis tool is Google Adword keyword tool, soon will be replaced with Google Keyword Planner. Basically it is developed for and is used by PPC advertisers, while most SEO peoples use it for keyword planning and research. Simply login to https://adwords.google.com/ko/KeywordPlanner/Home and type a keyword. if you are a blogger or a website owner then i will recommend to check only the Exact check box at the left side. 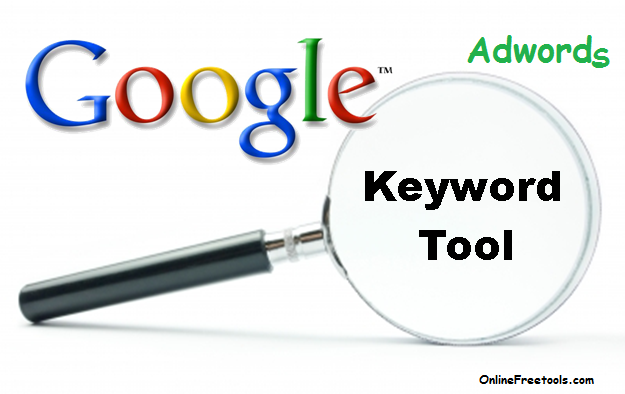 You will get a list of keywords that are related and are combination of your typed keyword. you’ll also get to know the competition probability for your search term as well as global and local searches. WordStream Google keyword tool has more features than Google Adwords keyword tools, a free version has limited features and you can try 30 keywords. Get information about search volume, competition probability value and the frequency for a specific keywords. Once you typed a keyword, then you can filter results by checking the boxes. WordStream Google keywords tools also help group related keywords. Google Trends is a free tool offered by Google, you can get information for a keyword that is being used the most, you simply type a single word or a phrase and get search volume data. you can see on the homepage the popular trends. Most recent searches over day,week and month. Keyword Eye is another keyword tool, that uses SEMRush keyword and Competitor data, best for evaluating competitive keywords and analysing them. The basic free version offers 10 keyword searches, 100 results per report over 10 Google country databases. WordTracker is a keyword analysing tool, that offer free and premium version. Over 340 million keyword database help you target the audience, gather information about most typed search terms and more features. KeywordDiscovery is another keyword research tool that give you up to 100 results per report. compare to other keywords tools it is easy to use and simpler interface. it also show you historical and seasonal keywords data. SEO Book Keyword Tool is an advance keyword tool that help you analysis not only Google keywords but also Bing and other trends. powered by WordTracker. KeywordSpay is another keyword analyser tool and can also be used for PPC and SEO. Discover competitors and their keywords. Just like Google keyword Planner, Bing Keyword Research tool is another keyword tool to get information about search volume and keyword ideas. Hit Tail is a keyword research tool alternative to Google Keyword tool, find the best keywords that suite to your website niche and target them. So these were some of the keyword Tools that can be used for keyword research and targeting the organic traffic that you want for your website. Most of them have Google keywords feature that enable Bloggers,website owners and internet marketers to get information for a specific keyword and expand the ideas, search volume and Local and Global searches in Google. Thanks Kamran. Keyword Eye uses SEMRush for keyword and competitor data but we are separate companies. I just thought I'd clarify as you mentioned that Keyword Eye is a tool by SEMRush, which is not the case. Thank you for your Feedback, i got your point, Keyword Eye is not a tool by SEMRush, they uses just some of the data. that are keyword and competitors for further analysis. Updated! Thank you for liking. Stay tuned for more marketing tools. Thank for liking our article. Keep visiting for more tools. You Most welcome. Thank you for reading. You Most welcome. yes you're right. Keyword tools are essential tools for SEO. I will check the tool you shared. Keyword research is the effective way to increase organic traffic for your blogs. Currently i am utilizing both long tail platinum (paid) as well as keyword planner (free) tools for keyword research. Thanks for sharing this informative article. Thank you for commenting on my blog Post. You're right and that's why I recommend it to my readers. IT's enough to have for whole type of keyword Research. Nice post Kamran, I really like the whole post and found it helpful for me in searching the right and best suitable keywords related to my site that will increase the organic traffic of my site. Before reading this post I was focusing on Google and not focus on the Bing Keyword Research tool now I found it more interesting for me. Hi Spook, Thank for commenting and appreciating the article, I'm glad to hear your words. Thanks for appreciating and commenting on my blog post.